The best Alphacool reservoir mounts of all times! 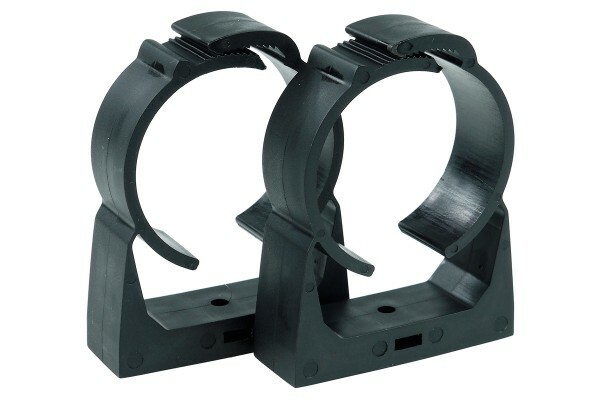 Many reservoir mounts were designed for the original tube reservoirs from the beginning of the PC water cooling sector. During the last years though, the reservoirs became larger, sized for more capacity and metal was integrated for the end caps. This resulted in heavier reservoirs, making the construction of more sturdy mounts imperative. With this universal mounting system every tube reservoir with an outer diameter of 50 or 60mm can be mounted safely and securely! The design is based on hose clamps, which are able to safely seal in pressures of multiple bar with their closed-loop clamping design. Of course a possibility for LED installation was also implemented. Two slightly pre-drilled holes in the back can be drilled as needed, and nothing stands in the way of spectacular lighting for your reservoir. Note: For mounting additional screws are needed. We recommend ordering Item No. 46023 with the mounting clips.